The “Thomas’s” battled in a playoff at the CVGA Turtleback Open with Thomas Longbella winning on the 1st Hole against Thomas Campbell. Longbella sunk at 35 footer to win for the second time in 4 tries this summer. He’ll return this fall to play for the U of M Gophers. 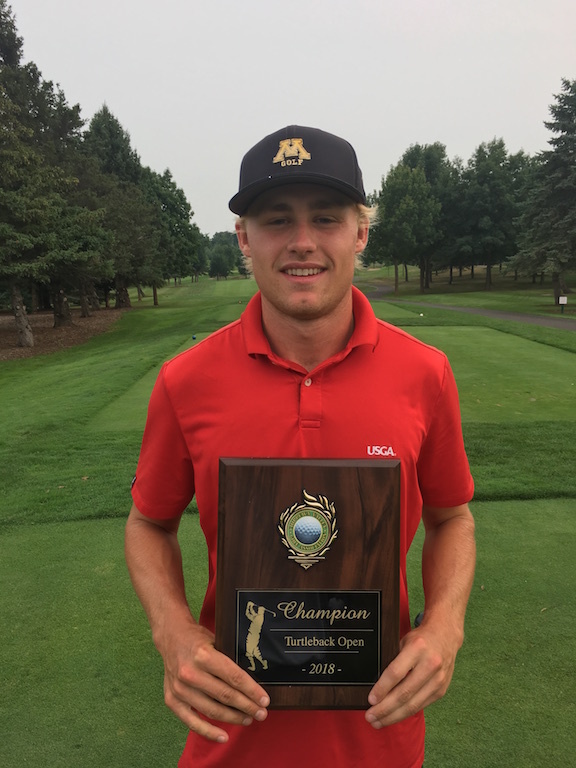 Campbell, meanwhile, was attempting to win his third CVGA tournament in a row, as he captured Lake Wissota, and Clifton Highlands Open consecutively. Both players shot 66’s. In third place was current U of M Gopher, Gus Minkin, who shot 68. 59 Players participated in ideal conditions at Turtleback. Special thanks goes out to Kevin Carter and the staff at Turtleback who did an outstanding job of welcoming the players and getting the golf course in tip-top condition. The CVGA will conclude the 2018 season at the Eau Claire Country Club on Sept. 8th. Print out the T of C Entry form and send in your entry fee with who you want to play with. Tee times are filling fast and we only get 72 entries…so get it done! !